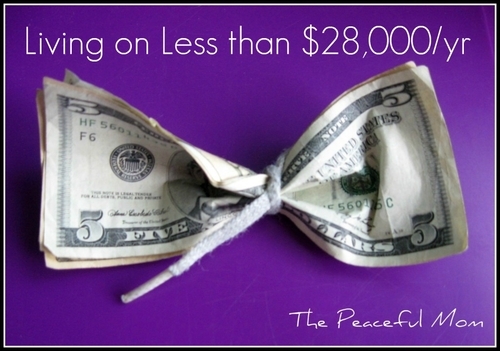 The Peaceful Mom has started a series regarding how she and her family are living on less than $28k/year. She just recently posted the 2nd part of this ongoing series. (You can find the first part here.) I think no matter what you’re living on, you should always examine where your money is going. Too often, Out of Time Mom is also Out of Money Mom. It’s really hard in this economy to make things stretch. In the latest post, she explains how she budgets/saves for those regular, but not monthly expenses, ie. insurance. I plan to continue to follow this series. Everyone can find ways to improve their financial life, and seeing what works for other people could definitely help!